The Manchester WordPress User Group is holding a WordPress translation day on Sunday 24 April 2016. A roundup of posts about WordCamp Manchester 2015, which took place on Saturday 10 October 2015, has been posted on the event website. The first joint Drupal and WordPress contributor sprint, organised by Jenny Wong and Mike Bell, takes place on Saturday 19 July 2014 at TechHub Manchester. WordCamp Manchester 2014 will be taking place on Saturday 28 June 2014 at Manchester Metropolitan University. Notes about the 19 March 2014 Manchester WordPress local group meeting have been produced by the co-organiser Mike Little. 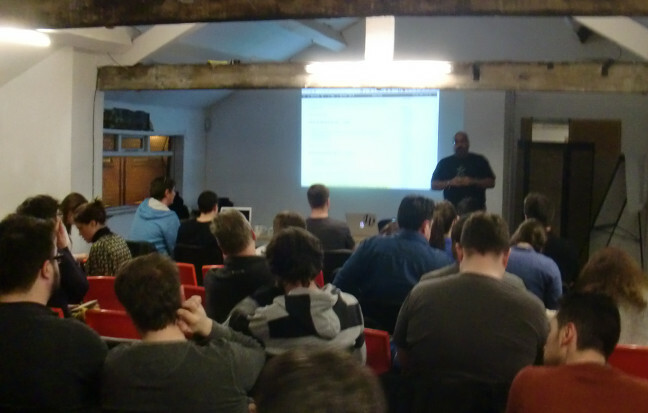 A new plugin and controlling WP through the command line were considered by the Manchester WordPress User Group (MWUG) at its meeting on Wednesday 19 February 2014. Daniel Pataki, web designer and WordPress editor of Smashing Magazine, spoke about a book he is writing about building a WP plugin. He said the book will cover the mechanics of building a plugin, as well as the often overlooked question of why are we building a plugin. The associated plugin, which will be open sourced when the book is launched, will extend the content management capabilities of WordPress, and Daniel gave a demonstration of a beta version. WordPress co-founder Mike Little gave a presentation on WP-CLI, which can control WP through the command line. Mike showed how WP-CLI can carry out such tasks as creating a database, installing WordPress and testing before updates, all without using the WordPress graphical user interface. MWUG meets on a monthly basis at MadLab, and is organised by Mike Little and Sarah Bailey. I’m unhappy that I missed MWUG this month. Looks like it was a corker and I would love to have heard Mike talking about WP-CLI. When I first decided to switch to using WordPress a year or so ago it was a visit to MWUG that really impressed me the most. Not only is WordPress the World’s finest publishing system, it was co-founded by a very nice chap who does a lot to make everybody feel welcome. Looking forward to MWUG in march! MWUG looks at new plugin and command line http://t.co/hOHOb0PsV7 <<< WP-CLI sounds interesting. Simon Owen gives a detailed report of the MWUG February 2014 meeting.